For people with a sight impairment, to aid concentration or just because it looks good. 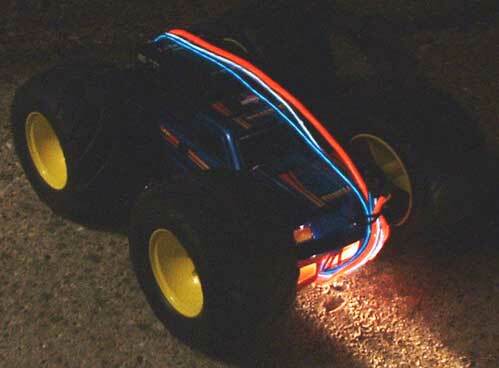 Using cheap light sticks, it is easy to make any radio controlled vehicle become a stunning visual effect in the dark. Attach 4" glowsticks to the roof of the car. 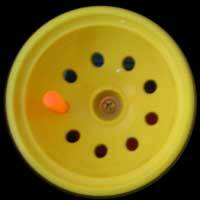 Use small 1.1/2" glowsticks in the wheel holes. N.B.Where fixing glowsticks in the wheels, ensure that they won't hit the car's chassis when the wheels turn. Use clear tape over the wheels to prevent the sticks flying out. "El' Wire" is cool flexible light, much like Neon only in the form of plastic wire. It can be wrapped around anything (see top picture). The Glowhouse - Online shop offering glow sticks and flashing novelties. Elwire Craft - Lovely Tron like El Wire kit to buy (UK). 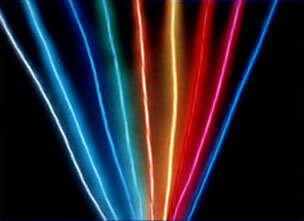 Live Wire - Electroluminescent wire experts and stockists (US). SureLight - Online shop (UK). The Glow Company - Light sticks and El' Wire (UK). Tizertech - Glow sticks and flashing novelties (UK). How Stuff Works - How Light Sticks work.